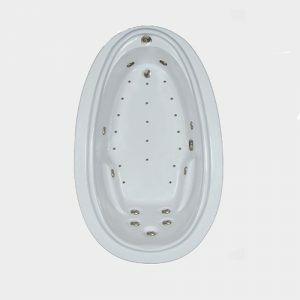 WaterTech Elite Combination Bathtubs provide a luxurious whirlpool experience with soft tissue massage jets using millions of heated air bubbles and high pressure water jets to massage and sooth joints and muscles. The Elite offers 20% more water depth which allows for multiple back and neck jets. 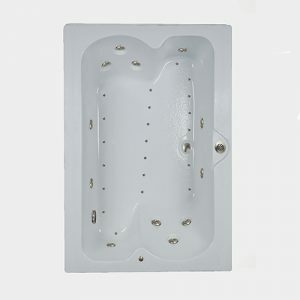 Give yourself a little more elbow room with the 6036 Elite combination tub. When you have a few more inches to fill in your bathroom, this tub will fit it perfectly and give you plenty of luxurious amenities to boot. Five recessed water therapy jets are installed in the sloping backrest, so you get a full-on back massage, while you recline in comfort against the molded armrests. Two curved foot wells allow you to stretch out your legs and get a premium foot rub at the same time. Four more jets on the sides reach your thighs and calves. Our 9-amp whirlpool pump provides all the power you need to get just the right amount of pressure through the adjustable jets, while our 8-amp heated air blower powers 18 air injectors to provide gentle massaging bubbles. You get added water depth too, with our Top Overflow which lets you add up to four more inches of water to our tub. 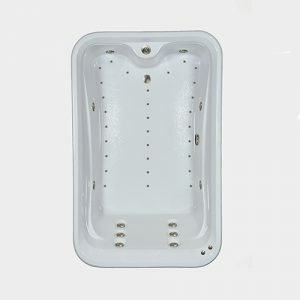 Sink your entire body down into the therapeutic swirling water in the 6036 Elite combination tub. Note: Prices do not include freight. Please call for pricing. The generous width of the 6042 Elite combination tub gives you plenty of room to spread out, but the tub will tuck neatly into your bathroom alcove with no problem. Its rectangular shape is perfect for a bath/shower combination, and its slightly angled deck directs water back into the tub. 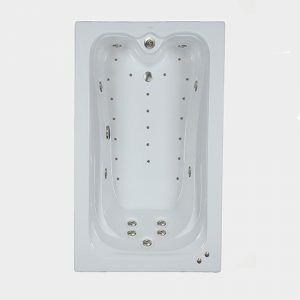 Eleven whirlpool jets massage your cares away with five dedicated to your neck, shoulders, and back; two aimed at your feet, one in each of the curved footwells; and four on the sides of the tub to reach your hips, thighs, and calves. The tub comes standard with a powerful 9-amp pump and rigid hand-formed PVC pipes that drain completely to make sure your water is fresh and clean. Twenty-one air injectors infuse the water with thousands of time massaging bubbles. Our steel-reinforced base and motor mount will stand the test of time, unlike other tubs built on plywood or particle board. Our beautiful tubs are made with a genuine Lucite acrylic shell, the best in the business for its long-lasting shine and durability. You can choose from a variety of colors to custom-fit your tub into your bathroom design. 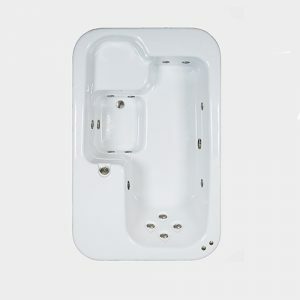 Make the 6042 Elite combination tub the center of your bathroom design. 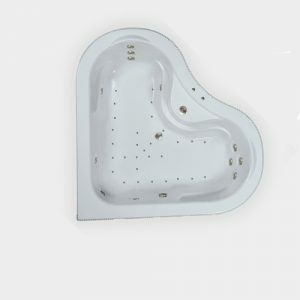 If you’ve got your heart set on a bathtub built for two, then the 6464 Elite combination tub is for you. This tub will maximize any corner you put it into. Two arched seats hug you and your partner in comfort with matching pairs of armrests and two different jet configurations for your back—one aligned with your spine, the other with key muscles in your back. All 12 jets are spa quality and come with a 3-speed pressure controller, so you can adjust the pressure at will. Take turns in the seats for a complete massage experience. Built-in headrests and sloped backs increase the comfort factor. The Top Overflow drain is placed on the curve between the two seats and allows for greater water depth than the typical overflow installed on the side of other tubs, about four to six more inches to be exact. Like all our tubs, the 6464 is made from Lucite acrylic, so it’s built to last and is easy to clean. We use galvanized steel to reinforce the tub floor and mount the motor, so your tub has a solid base to sit on. Our pipes drain completely, so water will not get trapped in them and ruin your water quality. Turn your bathroom corner into a hidden oasis for two by purchasing the 6464 Elite combination tub. Note: Prices do not include freight. Please call for pricing. An oval shape adds grace and elegance to the 7244 Elite combination tub and makes it an instant classic. Install it in an island, and it will become the centerpiece of your bathroom. Soak in its restorative benefits, and it will become your therapeutic spa. The Top Overflow installed on the tub’s deck means extra water depth, up to four more inches than standard side overflows allow. A water channel along the top edge of the tub emphasizes the graceful oval shape and directs water back into the well. Molded armrests blend seamlessly into the tub’s design and provide added comfort. 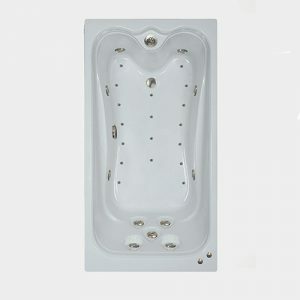 As you sit back and relax in the 7244 Elite, five recessed hydrotherapy jets massage your back, and six others massage your hips, legs, and feet. 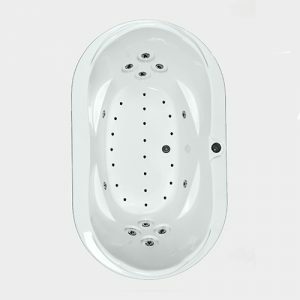 Nineteen air injectors on the tub floor aerate the water with millions of heated air bubbles to gently massage away tension in your body. This tub is not only beautiful, it’s also built to last. We use galvanized steel to build the tub base and motor mount, not plywood like other tub manufacturers. We use genuine Lucite acrylic for the tub’s surface for its shine and durability. Hand-formed rigid PVC pipes mean no trapped water in the plumbing. Separate lines to each air injector mean consistent air pressure and watertight lines. 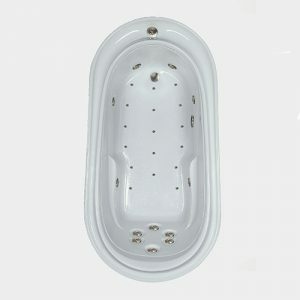 Rest assured you are getting the best quality tub in the industry and enjoy a spa-quality experience without leaving home.